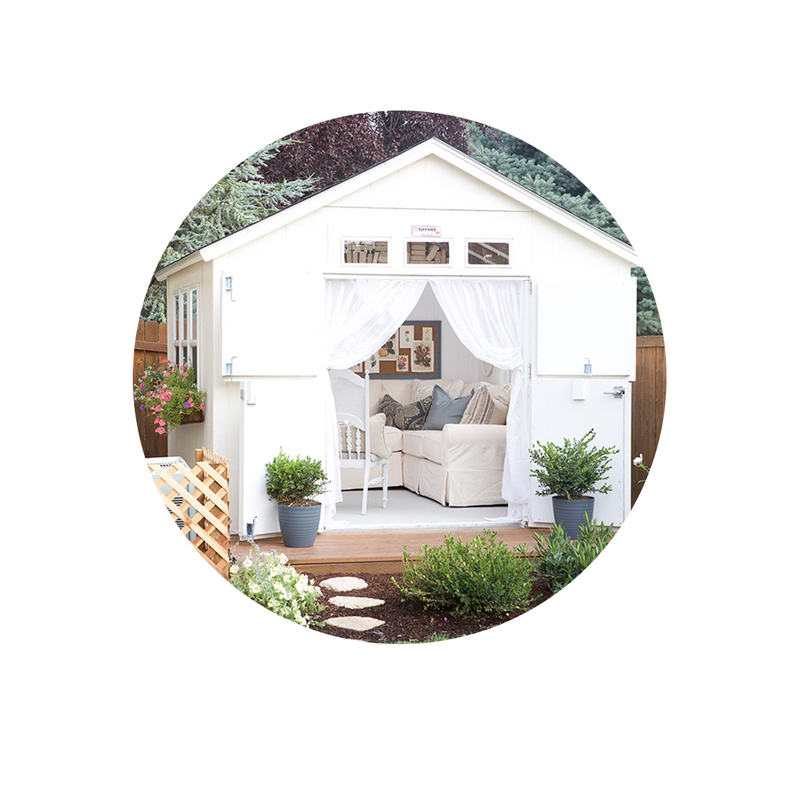 Hello, sweet readers! 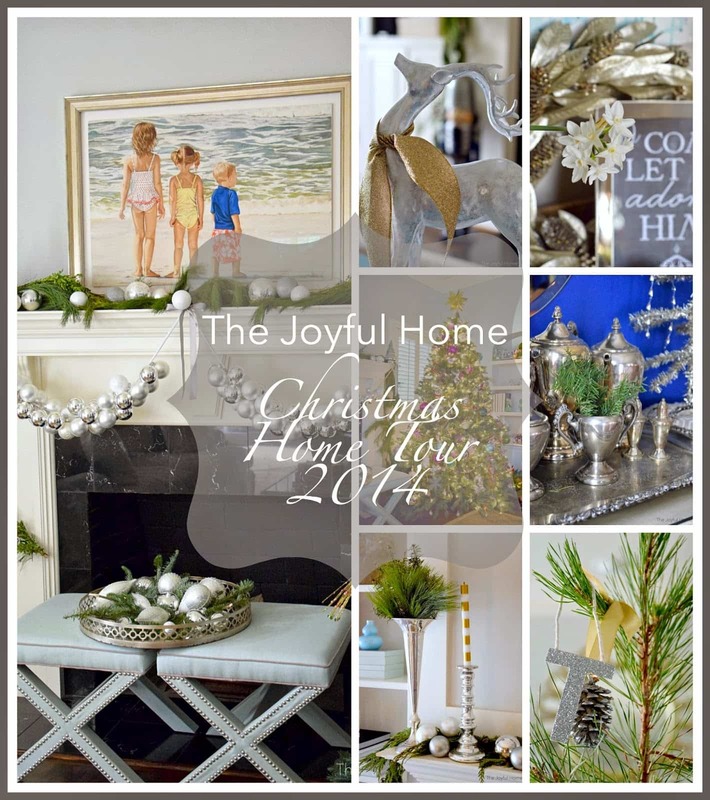 I’m Michele from The Joyful Home, and I’m so happy to be guest posting on Ella Claire today. 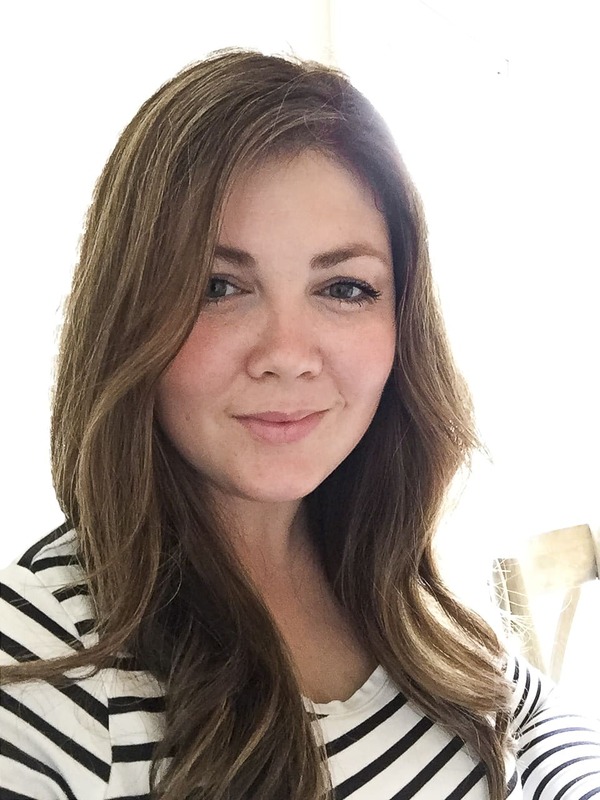 My youngest daughter is named Ella Claire, so Kristen’s blog is obviously one of my favorites. My sister-in-law is hosting Thanksgiving dinner at her new home, so I’m starting to plan for Christmas. 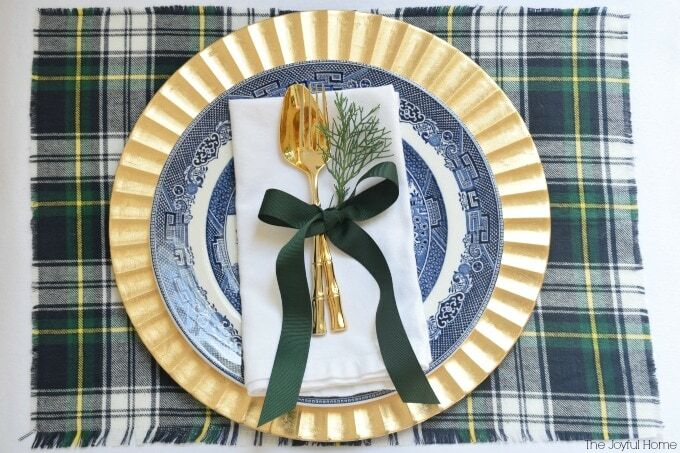 One of my favorite things to do is decorate my holiday table, and these DIY Plaid Placemats are taking center stage this year. 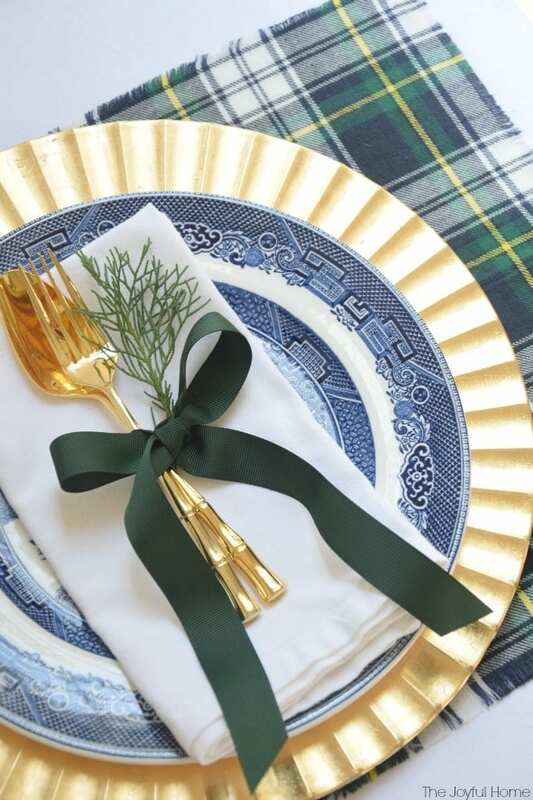 I love all things plaid, especially for the holidays. 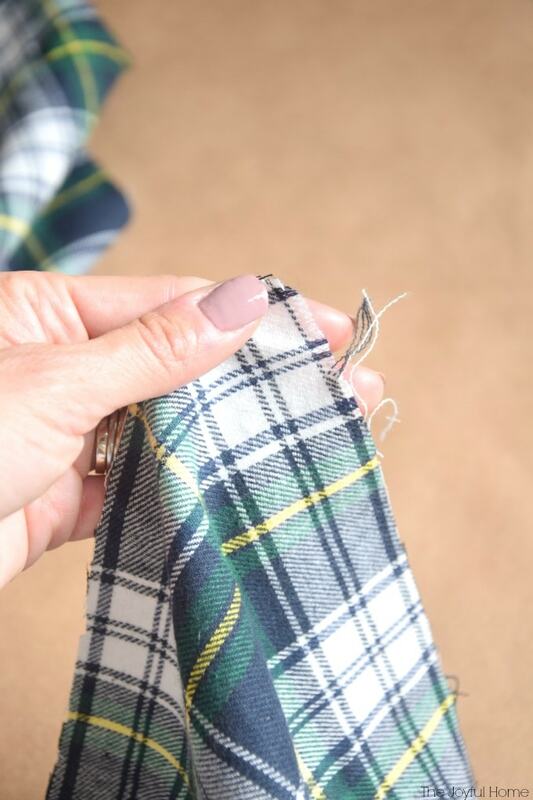 I did a DIY Plaid Scarf project last fall and had some leftover plaid flannel fabric that I’ve been dying to use. I knew it would make a perfect base for my Christmas table. Because I didn’t have enough fabric to make a table cloth, I made the next best thing…placemats. 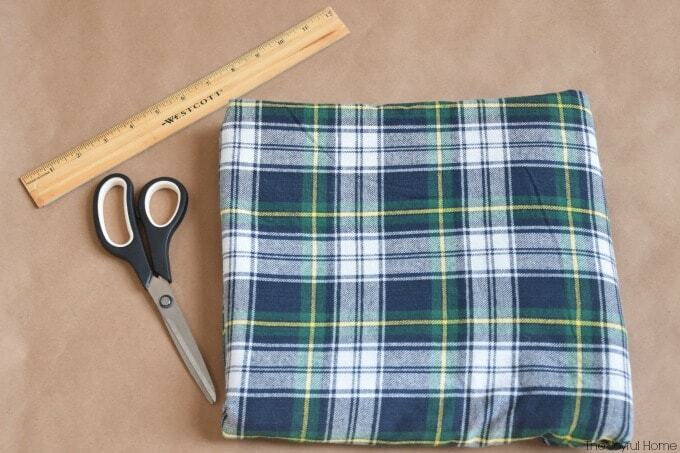 All you’ll need for this project is plaid flannel fabric, sewing scissors and a ruler. I bought my fabric online at Jo-Ann for under $5/yard. 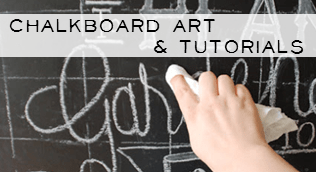 Using an existing placemat as a template, I made these placemats 18″ by 13″. 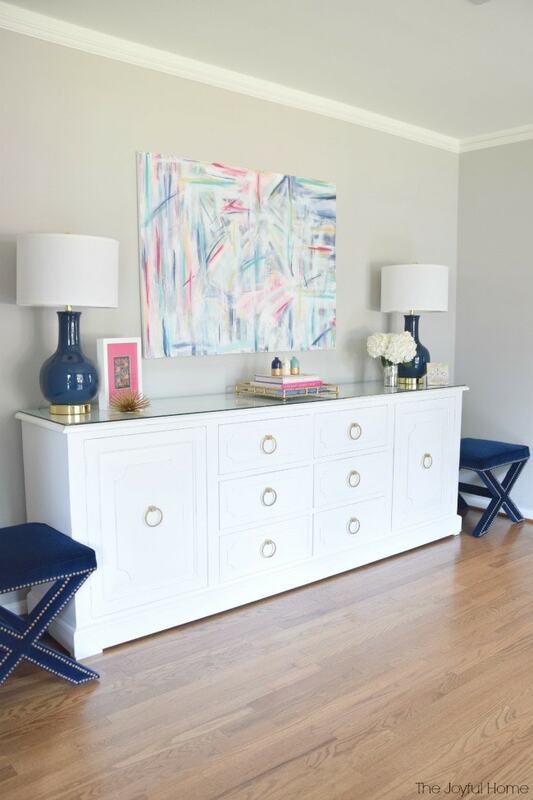 To start, lay the fabric on a flat surface with the seamed edge at the top. 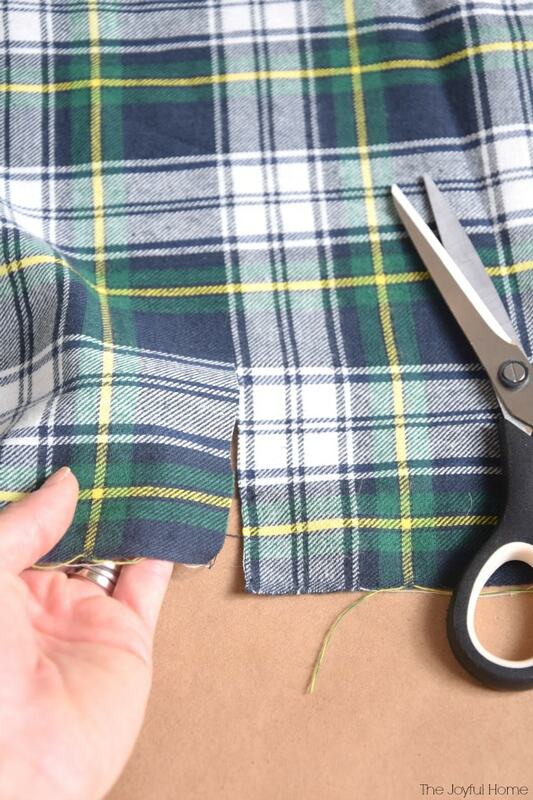 Using a ruler, mark the bottom edge of the fabric at 13″ intervals and then cut the fabric into strips. Next, cut each fabric strip into two 18″ rectangles. There should be a scrap of fabric left over at the seamed edge. Either discard or save for another project. Now onto the fun part–fraying the edges. Start by holding one corner of your placemat and pulling a thread with your fingers all the way down the edge. Keep pulling threads until you’re happy with the length of the fray. I ended up with frayed edges between 1/8″ and 1/4″. It doesn’t have to be perfect. I think imperfection is one of the charms of homemade things. Once you’ve frayed all four sides of your placemat, and you’re done! I haven’t pulled all the Christmas decor out of my attic yet, so I’m not quite ready to fully set the table. 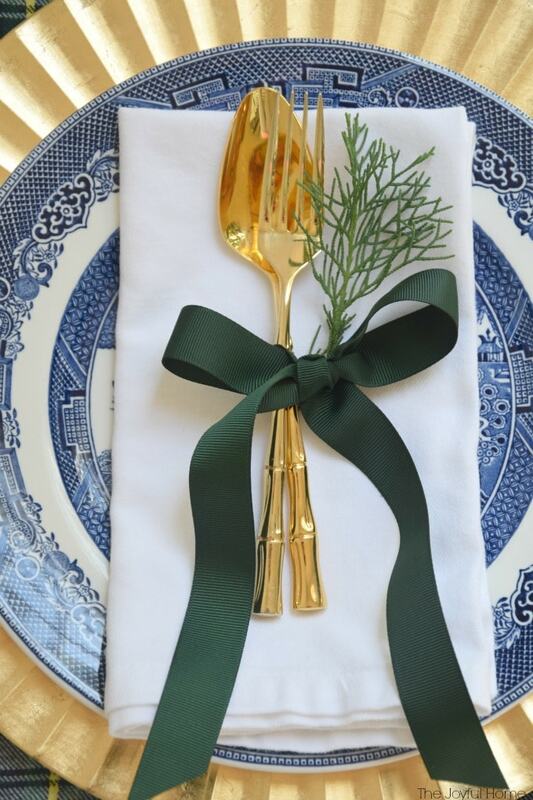 However, I couldn’t resist playing around with my dinnerware and staging a little faux table setting. Every year, I host Christmas Eve dinner and serve the same thing: taco soup and tamales. 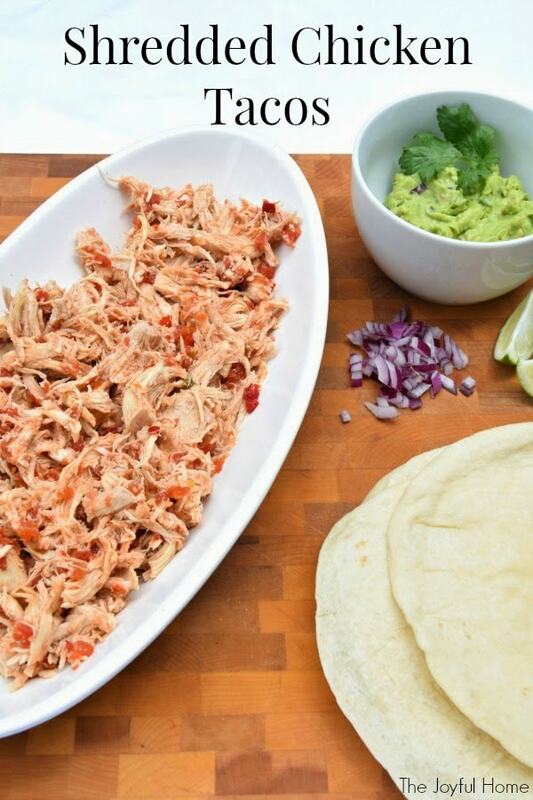 It’s a nod to my Mexican heritage and a meal that our entire family enjoys. To go along with that, I like a Christmas table that is casual, but festive. I think the plaid beautifully achieves that result. 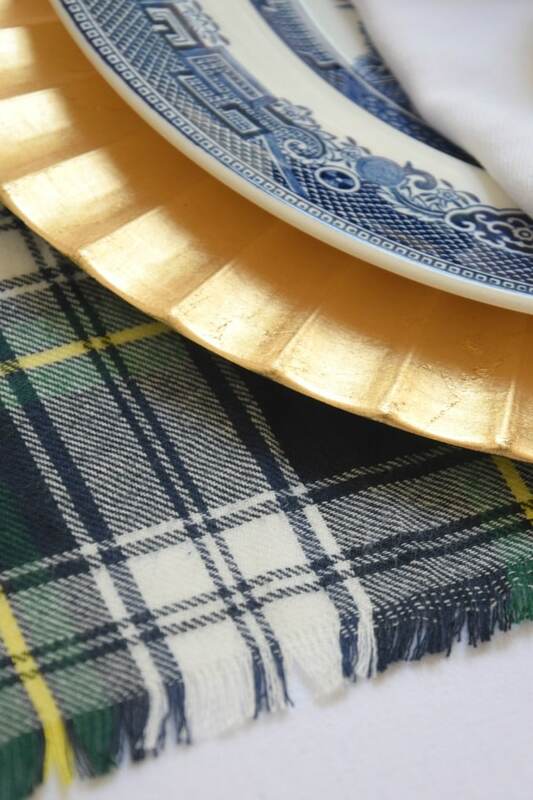 I love my Blue Willow everyday plates, and I think the blue plays so well off the plaid. 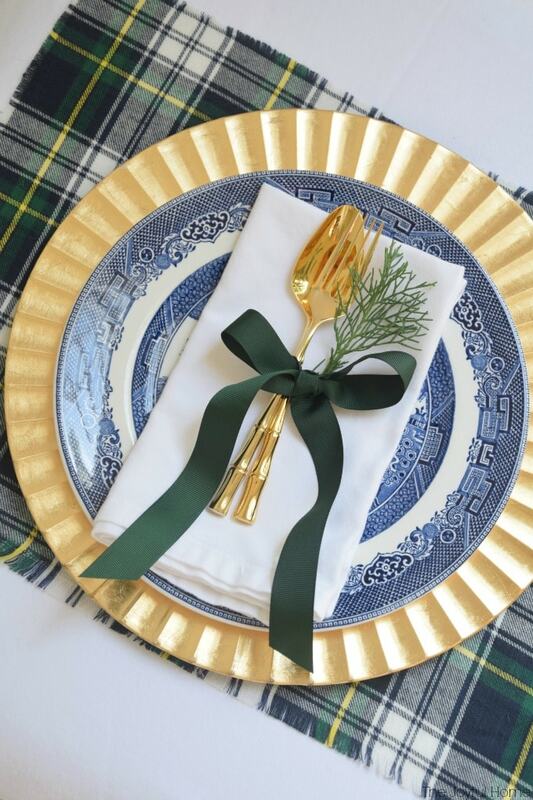 The gold chargers are perfect for the holidays to glam things up a bit, and I can’t wait to use this gorgeous vintage bamboo flatware that my mama is graciously loaned to me. Fresh greens add the last festive touch. Christmas greens aren’t available yet, so I snipped these off the Italian Cypress trees in my backyard. 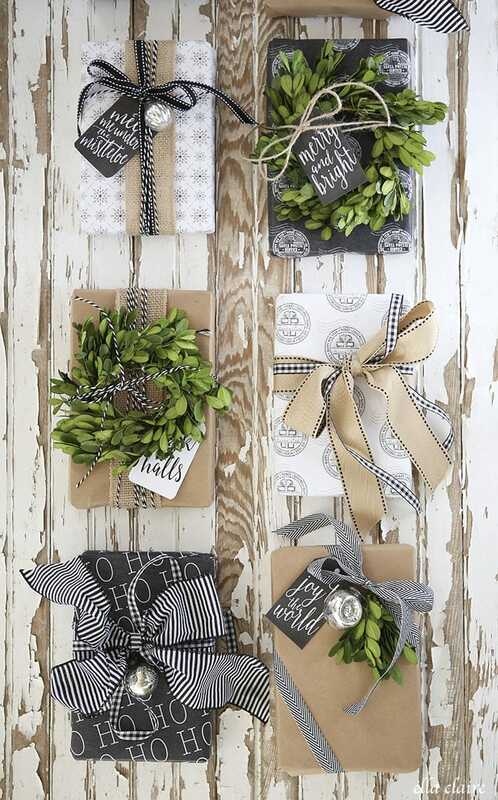 Tie it all up with a bow, and you have a festive and beautiful holiday pacesetting.